Welcome to the first Wish List post of 2016 and super comfy clothes seemed like the best way to kick off this regular feature. 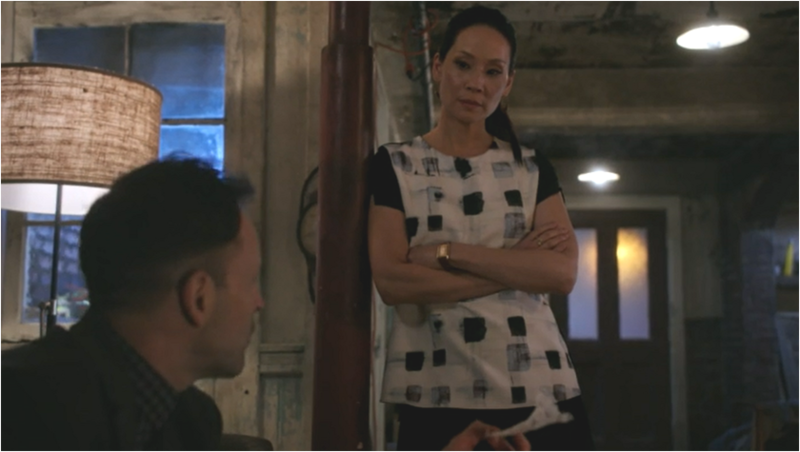 Joan Watson is one of the best dressed women on television and season 4 of Elementary has only doubled down on this sentiment balancing her on duty (often patterned) dress wonders with her at home relaxed (okay also on duty) attire. Generally when we do Joan Wish List posts we focus on her eclectic range of dresses and while we do have one of these planned in the not too distant future – there has been so many to covet so far this season – we figured it was about time her pajamas took center stage. It must cost a fortune to heat the brownstone, but one of my favorite details regarding Joan’s sleeping/kicking it around the house wardrobe is a) she’s always wearing some kind of slippers/bootie socks and b) the trusty comfy cardigan is a vital component. Working from home allows some leeway when it comes to your clothing choices (you should see what combination of everything knitwear I have on right now) especially when sleep gets interrupted. In last week’s episode “The Burden of Blood” Joan is woken in the middle of the night by Sherlock playing a disturbing piece of evidence over and over. There’s no need for getting dressed due to the hour/location and this means Joan pajama delights. The matching shorts and top are from Eberjey in “Oyster Grey Textile” and as with a lot of stuff Joan wears (and most characters on TV) it isn’t on the budget end. In fact this reminds me of another brand of sleepwear that cried out to me and that is Three J NYC, which featured on The Mindy Project. Basically I am instantly drawn to super cute pajama sets (see also Mimi-Rose’s J Crew pair on Girls last season). Returning to the idea and execution of the comfy cardigan and this is a close clothing relative of the wine cardigan. Comfort is key (it is a comfort cardigan after all) and the proximity you keep this item to your bed speaks volumes about its function. There are several in my rotation that perform this role and it can be one you wear out of the house although a true comfy cardigan is one which probably never sees the outside world. A hoodie also works and a lot of this depends on the time of year/how warm your house is. Plus, the longer the better. The best thing about the one Joan is wearing in the scene above (sadly I don’t have the exact details of where it is from just yet) is she wore it a few episodes ago (in “The Cost of Doing Business”) thrown over a vest top. Repeat costumes (especially when it is at home attire) ticks all my TV costuming boxes as I love to see a little bit of real world clothing situations thrown in among the expensive designer wear. For the second week in a row Joan wore note worthy pajamas and this time instead of grabbing her standard house sweater she instead put on a robe to answer the door to greet Sherlock’s father. There is something slightly less casual about this choice of garment over a well worn cardigan I guess. The pajamas in question are bolder this week coming from Stella McCartney (and keeping in that high end/splurge bracket even in the sale) and the “Poppy Snoozing” shirt and shorts can be found here. There is even an underwear set if you want to get really matchy matchy. Stay tuned for more Joan on The Wish List soon! 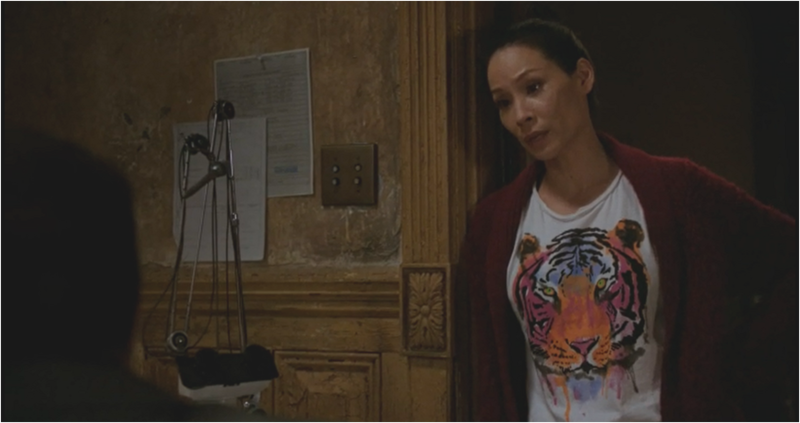 Joan Watson’s wardrobe is full of stunning outfits on Elementary and this character has featured multiple times on The Wish List. The most recent entry was this incredible Victoria Beckham ensemble which practically had me drooling over my keyboard while I wrote about it. Joan’s costuming tends to come from high end stores and there is an aspirational quality to these outfits. There is not an expectation that Joan will wear pieces that fall into what I would call affordable and I don’t expect to watch Elementary and think I could pop online and buy whatever she is wearing. In recent episodes however, Joan has worn several items from Zara and this store does fall into my budget range. Other Wish Lists have covered this notion of characters wearing clothes which don’t make you weep when you see the price tag with Jane the Virgin doing an excellent job of mixing designer with lower cost items and it is refreshing when this is the case. 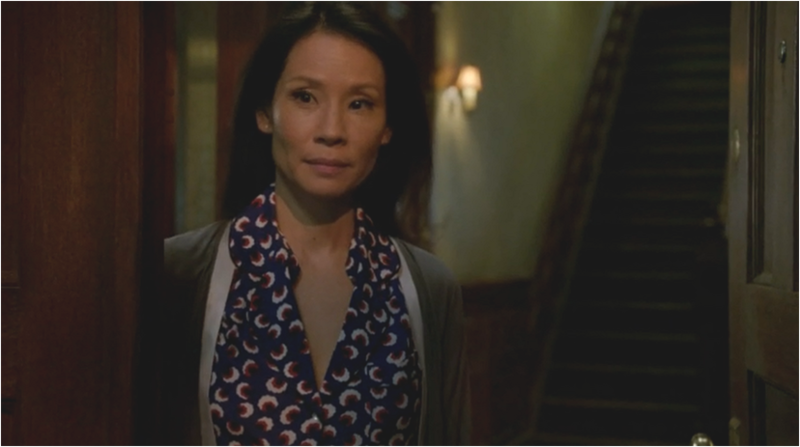 In last week’s Elementary “One Watson, One Holmes” Joan wore a couple of printed Zara delights. First a mixed fabric top sticking to her general muted color palette. Later when she decided to actively hang out with her friends instead of crying off with excuses she went fancier in a floral printed frock with the all important pocket detail. 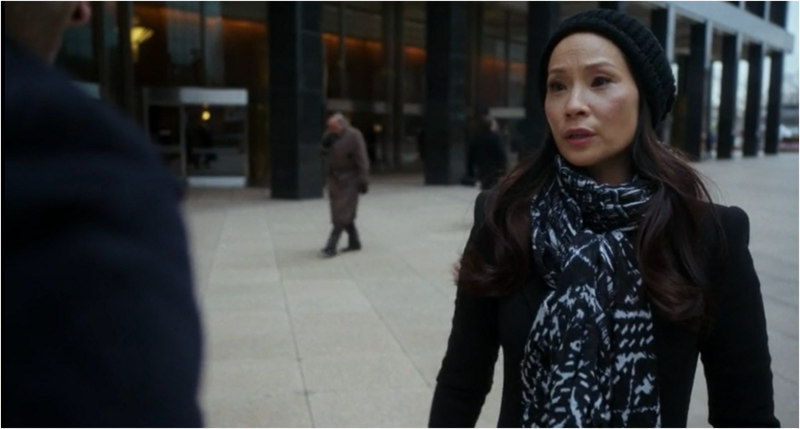 The coat Joan is wearing has appeared in previous episodes and fits into the higher end bracket (a fancy coat is an investment piece and the brr cold weather we have seen on Elementary this season shows how vital good outerwear is even if the price makes my eyes bulge cartoon style). And here is a closer look at this beautiful dress and one which is perfect for the changing season. Zara has been on trend for Joan and in the previous episode “The View from Olympus” she wore a matching patterned top and skirt; it is sadly no longer available in stores although it might be the kind of thing which will pop on eBay. For all things Joan Watson costuming related head here. 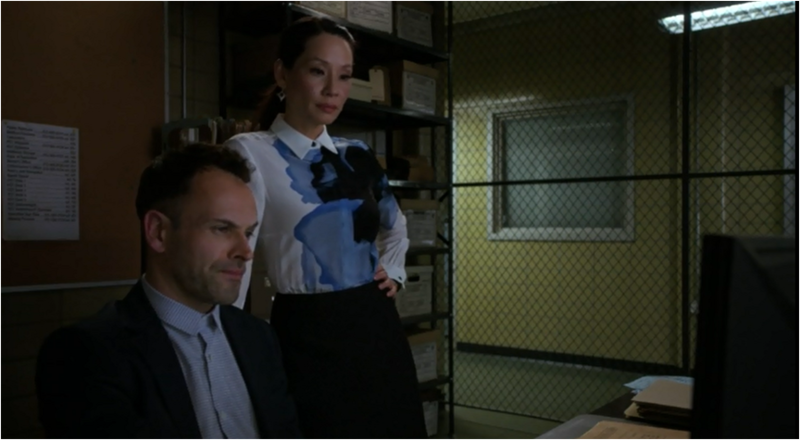 Coveting Joan Watson’s Elementary wardrobe occurs often with her incredible mix of silk prints, shift dresses, a-line skirts and one of the strongest boot collections on television. Even Sherlock has got in on the Joan style game with his pretty much perfect outfit gift a few episodes ago. Joan’s clothing palette generally hovers within the neutral circle of white, black and grey; color isn’t entirely absent but her power move tends to be through pattern. In “T-Bone and the Iceman” Joan switches things up with a stunning ensemble bringing in bold elements of color and print. A slightly more tailored approach and Joan tends to favor the oversized approach; this outfit is not the best for the messier end of detective work, but she has a good excuse for being this put together as she has come from an awkward lunch with her mother at a fancy restaurant. 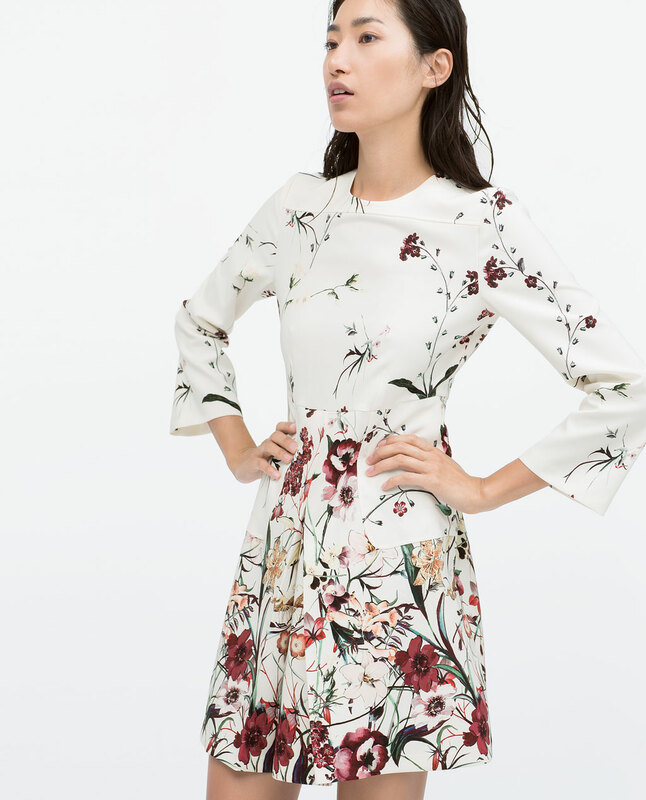 What I really love about the water color element of this floral print is that it looks slightly different in every shot we see it in. It is more of a swirly blur when she is sitting down and matches her anxiety at the difficult conversation she is about to have with her mother regarding her possibly deteriorating mental health. And while I know the snow must be an absolute pain to shoot in, it does also help create incredible vistas such as this one. 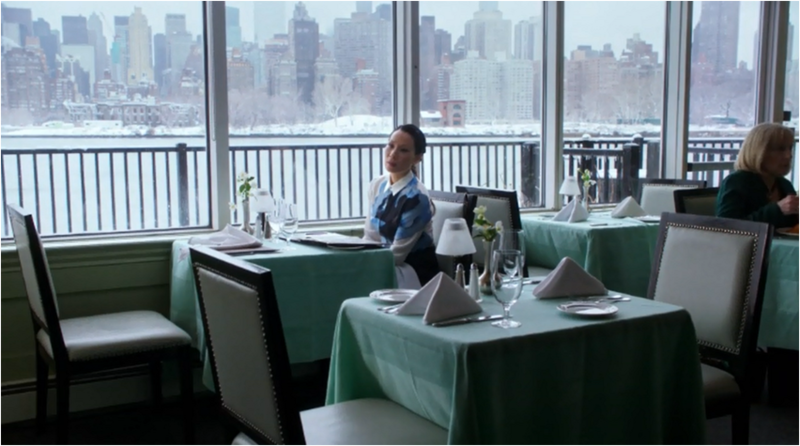 What this outfit does is make Joan the focal point whether she is in the dark station or in the icy looking (and feeling after her mother ditches her) riverside restaurant location. 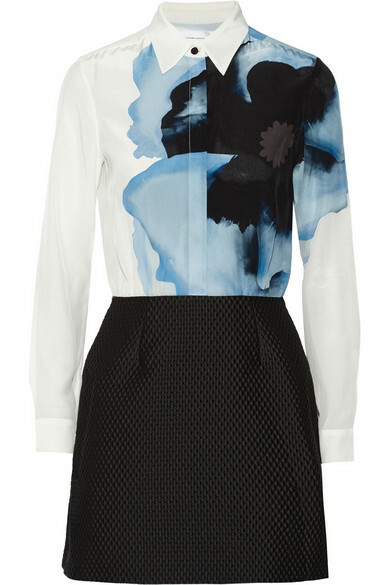 The Victoria Beckham contrast shirt dress appears to be two separates when it is in fact one combing a silk shirt with a quilted jacquard skirt. Perfect for all those awkward dinners and crime solving deliberations. Joan even throws in a trip to the morgue, but I would maybe advise against that. Or you could even go the Amy Poehler route and wear it to Trinity College in Dublin to receive a Gold Medal of Honorary Patronage from the University’s Philosophy Society. Either way this dress is on the Ultimate Wish List. 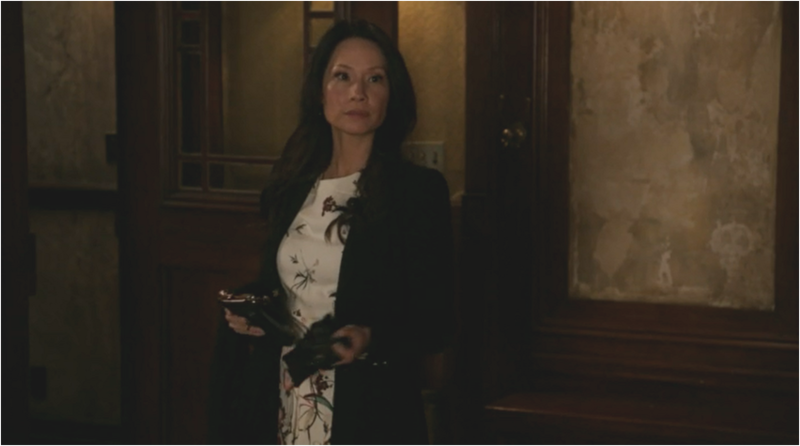 Sherlock tends to favor an abrupt awakening for Joan on Elementary, however when she stayed over at the Brownstone in this week’s episode “Hemlock” he went with a far more pleasant approach including breakfast in bed, a new pair of boots and a fantastic day dress. This definitely makes up for pointing out how little she feels for current beau Andrew and the fancy outfit she was wearing the previous night might not be the best for day detective work. Sherlock gets major points for this and as I mentioned on Twitter this looks like the point where shooting in New York got particularly cold as super warm (and stylish) coats, gloves and knitted hats are on display – my current winter hat of choice looks a lot like the one Joan is wearing below – are all part of Joan’s costuming so those boots are a must. I also like to think she is wearing something of Sherlock’s in bed even though I can’t imagine him with a ratty bed tee collection. So what about the dress in question? Sherlock didn’t scrimp as the herringbone silk stripe dress is from Edun and sticks to Joan’s signature slightly oversized style; it makes sense with his observation skills that Sherlock would nail this clothing gift. While I am enjoying Joan and Sherlock living apart at the moment and how this has impacts their relationship dynamic allowing both of them to grow; if the treats of breakfast food and clothes were to be more than just a one off I can understand why Joan might want to move back in. Plus after what transpires at the end of “Hemlock” the Brownstone might be the safest place for Joan right now. For more Joan Watson Wish List ideas head here and here. Fashion Week continues in London as more RTW Spring 2015 collections are unveiled and so it must be time for more Fantasy Costuming. 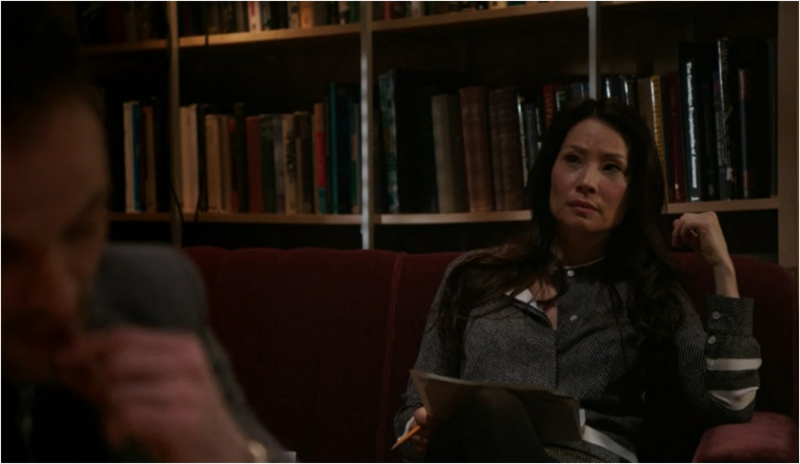 Joan Watson on Elementary manages to look casual, stylish and professional all while putting up with Sherlock and whatever crime they are tasked with solving. Shift dresses, a-line skirts paired with tights, boots and an endless stream of incredible coats to protect against the New York City elements are all Joan staples; now she won’t have Sherlock throwing outfits at her when she wakes up as she’ll be in her own place. Joan’s costuming tends to be on the white/grey/black scale, but it doesn’t mean this is a bold color free zone and Joan does wear color and especially print on many occasion. Hemlines tend to be short and so most of these choices reflect that and as always the Fantasy Costuming selections are inspired by the costume design from the show in question and are in no way suggesting this character should wear a specific item mentioned. 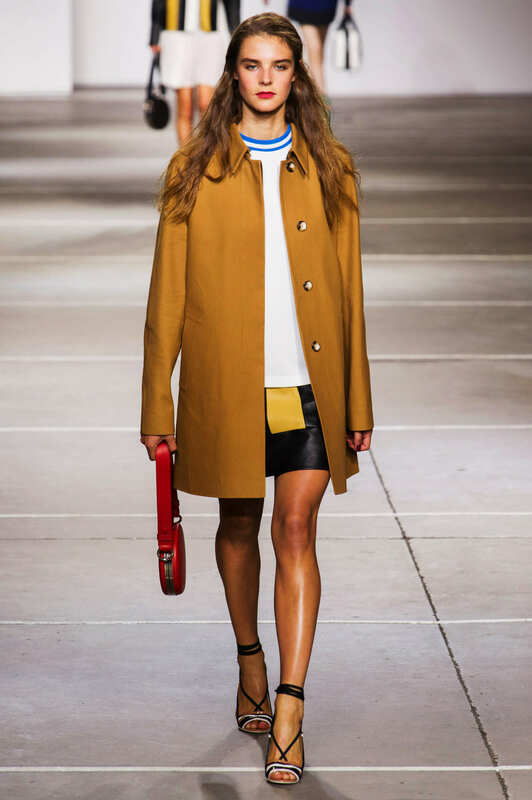 Casual cool from Topshop Unique with a mustard yellow coat, leather skirt and white sweater. Throw on some tights and boots and it’s Joan (as these are Spring collections replace all the sandals with the kind of footwear we typically see Joan in). From J. JS Lee here is the first of several shift dresses. Going to start with the more muted palette and work our way up to the bolder entries. McQ Alexander McQueen; simple and effective. Dropped waist, slightly longer and in navy from Jasper Conran. 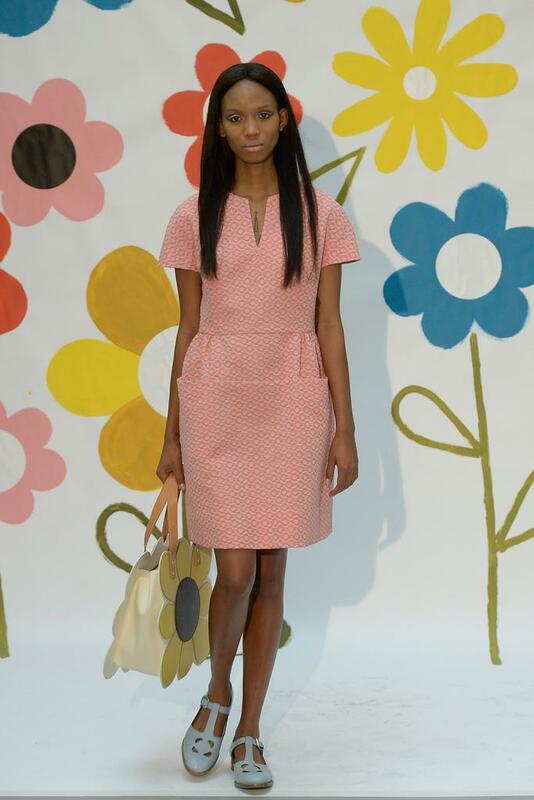 Here comes the color; pink and textured from Orla Kiely. I’d like to think that is one big pocket, but alas it’s probably just seam detail. Color and pattern with this Mulberry dress (plus an all nature backdrop). Love the slightly longer sleeves. So here is the color apex and I might have been swung by two of my favorite things – yellow and pockets – but the silhouette on this Paul Costelloe frock is all Joan. This is more for Joan going on a date (and yes she will be getting a love interest in season 3) and Lucy Liu would look fantastic in this retro-futuristic Tom Ford. Pockets, patterns and texture from Saloni in another super cute casual frock for Joan. When I think of peplum on TV I think of Alicia Florrick long before Joan Watson, but this Giles ensemble is far more Joan than Alicia playing with peplum, pockets and pattern in a funky manner. A lighter looking coat (this is a Spring collection after all) and an all Joan outfit from Antipodium (as long as we ditch the sandals). For more on Joan Watson’s costuming head here and here. Elementary returns Thursday, October 30.